James Smith: On The Impeach Donald Trump Train? Rep. James Smith is aligning himself with more far-left liberals. This time, it’s the liberal billionaire who is behind the movement to Impeach Donald Trump. Brand new reporting today shows that James Smith used his disabled-veteran status to run a fraudulent pass-through business, profiting off of millions of dollars in contracts from the Department of Veterans Affairs. On June 28, the House convened to pass a budget and decide if they would stand with the governor to demand full rate relief for South Carolinians paying for the failed nuclear project at VC Summer, or override his veto. Element Electronics announcement that it received an exemption from tariffs yesterday left James Smith with egg on his face–again. How would James Smith pay for $32 Trillion “Medicare for All”? This morning, the Mercatus Center released a new study that shows the socialist “Medicare for All” plan gaining mainstream Democrat support is projected to cost taxpayers $32 trillion. COLUMBIA, SC (WIS) – After two weeks of campaign ads, a debate, and an election eve rally from President Donald Trump, the Associated Press has called the GOP gubernatorial primary runoff race for the incumbent Henry McMaster over Upstate businessman John Warren. Vice President Mike Pence’s visit today to Conway was amazing! 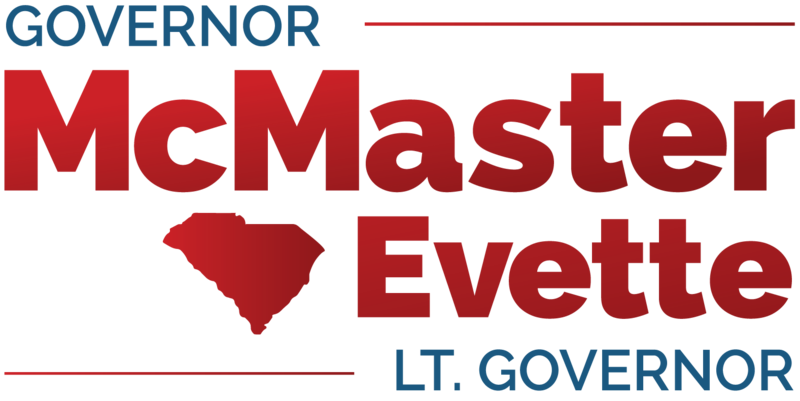 His message to all South Carolinians was clear: we need to get out and vote for Governor McMaster on Tuesday. NEWBERRY – Tonight, the McMaster for Governor campaign issued the following statement from Ambassador David Wilkins on Governor McMaster’s victory in tonight’s debate. COLUMBIA – Following a successful first day on the #SCWinning Bus Tour, today the McMaster for Governor campaign made campaign stops in Anderson, Aiken, Lexington, and Mt. Pleasant. On top of the 155 business leader and legislator endorsements he received yesterday, the governor scored nine new endorsements today. Watch the Lowcountry endorsement video and see the full list of Henry McMaster’s endorsements below. Gov. Henry McMaster managed to connect an anecdote about his bulldog to Samsung’s expansion in South Carolina, all in response to a question about improving higher education. He met casually with a group of about 50 students, mainly members of the College Republicans, in Russell House Tuesday night to talk about his career and answer questions on major state and local issues. FLORENCE, S.C. – Gov. Henry McMaster and his running mate – Pamela Evette, a businesswoman from Travelers Rest – made a campaign stop Monday evening in Florence at a meeting of the Florence County Republican Women and the Florence County Republican Party at the Floyd Conference Center. After being introduced by Mal Weatherly, chair of the Florence County Republican Party, and receiving a standing ovation from those present, McMaster began his speech by outlining his connection to the Florence and the Pee Dee region. McMaster listed several cousins still living in Florence. The building McMaster gave his speech in, the Floyd Center, is named after another cousin, Eddie Floyd. COLUMBIA, SC – Gov. Henry McMaster is hitting a GOP primary opponent for not releasing more information about how much money she was paid for her work in state government and consulting, and the incumbent’s campaign isn’t beating around the bush. The results come from a poll of 800 S.C. registered voters — 400 Republicans and 400 Democrats. Conducted by Target-Insyght, a nonpartisan Michigan-based research and polling firm, the survey found 46 percent of South Carolina voters would cast their ballot for McMaster if they could vote today, compared to 22 percent who said they would vote for Templeton. Vietnam veterans were thanked and honored Thursday. Gov. Henry McMaster in front of a crowd of veterans spoke at the first annual South Carolina Vietnam War Veterans Day at the South Carolina State House. U.S. Rep. Joe Wilson was also on hand for the event, along with many other dignitaries, including S.C. Adjutant General Bob Livingston. A new video by Gov. Henry McMaster (SC) exposes the Never Trump forces funding his primary challenger Catherine Templeton in South Carolina’s upcoming gubernatorial election. The video, obtained exclusively by Breitbart News, shows Templeton’s ads as funded by the American Future Fund, a group that funded multiple attack ads against Donald Trump in the recent presidential election. “It should come as no surprise that one of the most anti-Trump groups of the 2016 election is supporting Catherine Templeton, who is known for flip-flopping and twisting the truth,” said McMaster’s campaign spokeswoman Caroline Anderegg in a statement to Breitbart News. S.C. Gov. Henry McMaster has something no other candidate for governor has — a running mate. Introducing herself to members of the Clover-Lake Wylie Republican Women’s Club at the affluent River Hills Country Club Friday, Pamela Evette shared the story of how she became McMaster’s running mate.